How to become a great doubles partner. Bill Previdi and his son Matt, playing doubles at the National Father-Son at LaJolla. July 2011 -- People often come to me with problems related to their doubles partners and questions about how to become more successful as a doubles team. Some ask how to choose a partner, and others want to know how to become a better partner themselves. Don't sell your partner out. Don't blame them for a loss. On the flip side, be willing to give them credit for a win, even if they didn't do much to earn it. This will show them that you are there for them in good times and bad and that you're willing to share the credit with them when good things happen. Everyone will want to play with you. Step up when they're struggling. When your partner is having a difficult time, look at it as an opportunity to bring something special to the team. Bring more focus to your game and take the situation as a challenge to see if you can raise your game under adverse conditions. If they can't win a point on their return, then you have to win every point on your returns. Here's your chance to play your best! If you can't, maybe you're not as good as you think. Know what they need. You almost need to be a chameleon when you play with different partners. If you're good at interpersonal relationships you will get a sense of the best way to offer support and build confidence in your partner. What works with one partner may not work at all with the next. Sometimes even the same partner needs different things on different days. The bad news is that if you struggle with relationships you will probably have a difficult time being a good partner no matter how good a player you think you are. Be consistent, not flashy. When I was in college our coach always said that you have to make a choice. You can look flashy or you can win but you can't do both. No one wants to play with someone whose goal is to make a lot of big shots and spends the rest of the time missing. It's very unnerving for your partner. You should be trying to set your partner and the point up, not try a lot of ego shots. Relax. You know that when you're tense, the people around you can feel it. The same is true on a tennis court. Whatever is going on, whatever the score, you need to look at it as an opportunity. As long as the match is going on there is time to try something else. Whether you win or lose you can learn to be more resourceful and resilient, two traits that will serve you well in future matches. Take the blame, even when they miss. If your partner misses a first volley, tell them that you're sorry that you didn't help them by poaching. This shows them that you are looking inward for ways to help the team. If there's something strategic that you think might help them, say it to them in reference to yourself. Here's an example: "I have to remember to hit my passing shots down the middle rather than going for risky shots down the alley." Or, "we can't win if all the points keep ending on my racquet!" If they don't catch the hint, at least you tried in a positive way. I hope by now you're realizing that the same things that make you a good spouse or friend also make you a good tennis partner. The willingness and desire to do more than your fair share, to share the credit and the blame, and to stay calm under pressure are the keys. Wanting a result too much will make this even more difficult. If what you are seeking is to be able to fulfill your potential on a regular basis, short-term thinking and focusing on results rather than the process will never get you there and will make it much harder to connect with another person. I see so many people who look (and act) unhappy when they are playing matches. The only moment that matters to them is the moment the match ends. That will determine whether they will have relief or sorrow. In all my years of playing I have met very few players who truly love every minute of competition, regardless of the score or the result. But, those who do are the best partners. Work toward that goal and make your tennis experience much more enjoyable. Bill Previdi was trained at the Port Washington Tennis Academy in New York and attended St. John's University (where he had two undefeated seasons in doubles) on a tennis scholarship. 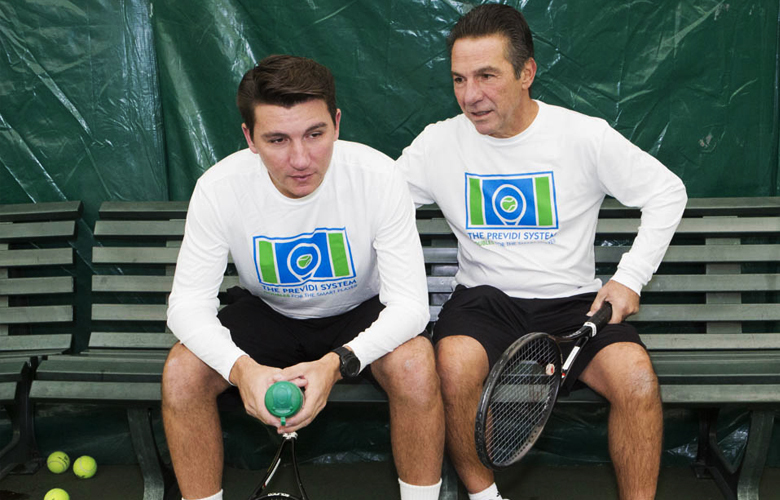 He has been a head pro since 1981 and has also coached high school and college tennis. Bill and his son, Matthew, were ranked No. 1 in New England and No. 20 in the nation in father - son doubles in 2008.